Hi! A friend of mine is digging up a perennial garden and gave me bunches of flowers to transplant. I planted it, and am wondering... do I cut it back? Will it flower again? so now I'm committed to keeping it alive. It also has a wonderful smell. Thanks for your help. The Bee Balm plant grows best in full sun but will tolerate light shade. Bee Balms thrive in any moist soil that is rich in organic matter such as manure, compost, or leaf mold. Fertilize in the spring with a good all purpose (10-10-10) liquid plant food. Be sure to allow for good air circulation around Bee Balm plants to prevent attacks from powdery mildew! You can stimulate a second flowering in the same year by cutting the flowers right after they finish blooming. 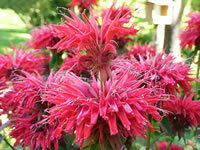 In the fall, prune your Monarda plants to within an inch of the ground. Monarda plants grow from two to four feet tall depending on the variety, and will fit well into your Hummingbird, Butterfly or Herb Garden. Lower growing varieties of Bee Balm can be used for a perennial border planting. Like other members of the Mint Family, Bee Balm can become invasive, but you can keep your clump contained by dividing the clump in either spring or fall. 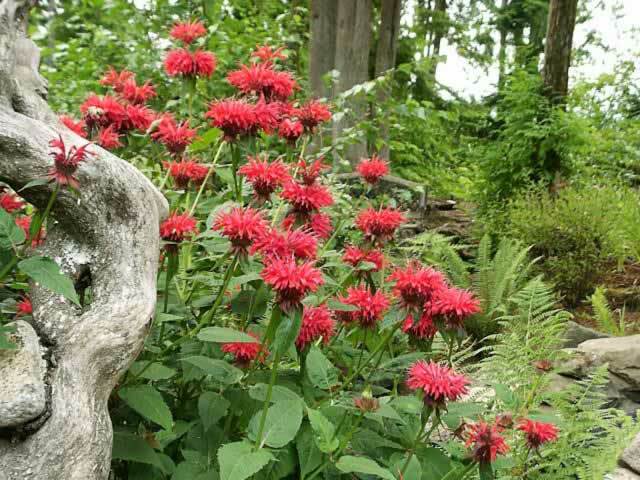 Bee Balm plants should be divided every 3 years anyway, to keep them looking tidy. Dig up the root clump in the early spring, discard the older, inner portions, divide the remaining parts and re-plant the new divisions 12 to 15 inches apart.